The 4th of July is approaching, have you thought about your pets? Many pets, more specificity dogs, get frightened by all the sounds of fireworks. The loud noises frighten them so much that some pets escape from their yards and end up getting lost. Some people just give whatever medication they have in their medicine cabinet to their dog to help calm them. It isn't safe to give over the counter medicine to your dog without the approval from the vet, you can make your dog really sick or worst case it might be fatal. In some cases if the dog has extreme anxiety the vet can prescribe medication. My dogs get upset with the fireworks on 4th of July, but we are able to help them without medication; here are some suggestions of things that work for many dogs. If you don't want your dog to have full access to the home I suggest putting them in a bathroom, bedroom or a room where you can gate off access. Some dogs get so anxious they end up having potty accidents, chewing or destroying things in the room they are in, keep this in mind & try not to get upset with your dog if this happens. If all else fails you might want to have someone stay home with your dogs to "babysit" them, especially if it is their first fireworks experience or they are new to your family. If your dog manages to escape & gets lost, be sure to check all local shelters, your neighborhood and use social media to help find your pet. Hopefully your dog is microchipped and recovering them will be a easy process. 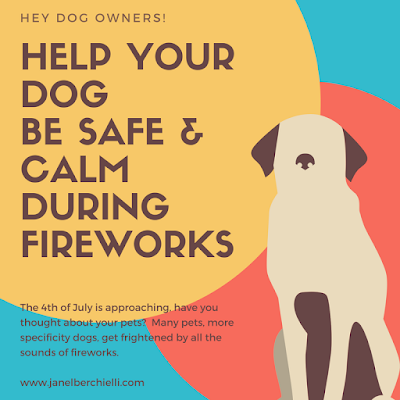 I hope these tips were helpful for you to keep your pet safe and calm during 4th of July fireworks.